If you think waste is someone else’s problem…think again. 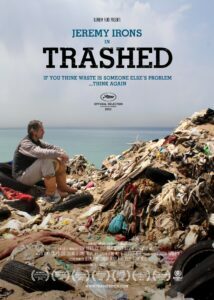 In Trashed, actor Jeremy Irons sets out to discover the extent and effects of the global waste problem, as he travels around the world to beautiful destinations tainted by pollution. The film reveals surprising truths about very immediate and potent dangers to our health. It is a global conversation from Iceland to Indonesia between Jeremy and scientists, politicians and ordinary individuals whose health and livelihoods have been fundamentally affected by waste pollution. Visually and emotionally, the film is both horrific and beautiful, equal parts a story of human interest and a political wake-up call. This is a meticulous, brave investigative journey that takes the viewer from skepticism to sorrow, and from horror to hope.